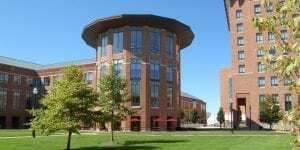 The Ohio State University business school was originally founded in the spring of 1916 as the College of Commerce and Journalism, housed at Page Hall. In 1927, the school was renamed as the College of Commerce and Administration, just a few years before the establishment of the school’s MBA program. After decades of expansion, including the addition of an Executive Education program in the mid-1950s and numerous name changes, the school received a $20 million donation from ’30 alum Max Fisher. His gift helped officially rename the business school as the Max M. Fisher College of Business in 1993. The Fisher College of Business is located at the northern entrance of Ohio State’s main campus in Columbus, Ohio. The 370,000 square-foot complex is the largest multi-building project ever undertaken by the university and one of the few fully integrated management education campuses in the nation. Fisher’s campus features a state-of-the-art computer network, satellite up-link capabilities, video-on-demand and nearly 3000 computer ports. The $120 million project includes five academic buildings and a separately funded hotel, the Blackwell Inn and Conference Center. There are currently 94 tenure track, 10 clinical track, 58 full-time non-tenure track members of the faculty. There are currently 7,552 full-time undergrads at Fisher, 91 members of the 2019 MBA class, and 94 members of the 2020 class. There are also 354 enrolled students in the MBA for Working Professionals program, 32 in the EMBA program, 96 in the Master’s of Accounting class, 47 in the Master’s of Business Logistics Engineering, 25 in the Master’s of Business Operational Excellence, 103 in the Master’s of Human Resource Management, 56 in the school’s Ph.D. programs, and 60 in its Specialized Master of Finance program. The Fisher College of Business offers full-time, part-time, and Executive MBA degrees.